After growing up with slavery on his family’s plantation in South Carolina and later receiving his degree in 1855 from the Yale School of Law, Benjamin Cartwell’s life becomes dramatically altered. 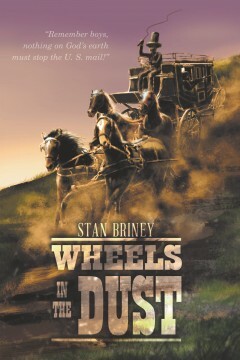 Ben discovers just surviving on the raw and dangerous Western frontier challenging when asked to assist staging mogul John Butterfield, the mastermind architect of the Overland Mail Company, in establishing the infrastructure and placing into operation the epic transcontinental mail route between the Mississippi River and San Francisco. This is a graphic and gripping story based on documented history that should keep the reader’s attention riveted to its last page. Stan Briney’s penchant for creativity and detail is clearly shown in his work as a professional artist and in his recent works in freelance writing. This is his 6th novel. The author obtained Bachelor and Master of Science degrees from the State University of Iowa followed later by his graduation from medical school. His medical specialty in Diagnostic Radiology provided him a long and distinguished professional career in both clinical and academic medicine. Since early childhood and without formal art training, his natural born talent in art has earned him recognition and honors. Following his retirement from medicine in 1995, he has developed a very successful second career as an award-winning professional artist. His realistic bronze sculptures and illustrations can be found in private art collections, homes, offices and schools within the United States. Briney and his wife reside in the cattle ranching country of north central Texas where he has a small art studio and gallery in their country home. The Briney’s have three children, five grown grandchildren, and two great grandchildren.